For spring or autumn cropping of, hearted or 'greens'. An old favourite producing solid, pointed, tasty green heads. 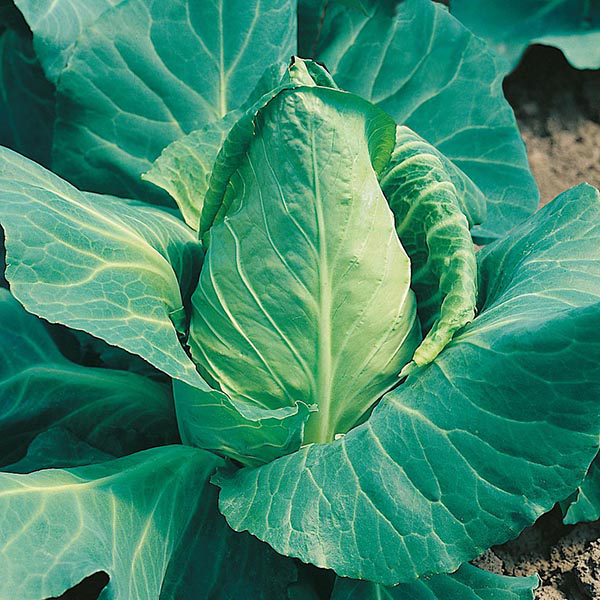 There is most definitely a cabbage for all seasons, supplying a good source of vitamin C and antioxidants through the year. Last Order Date: Despatch: From 1st May 2019. Outdoors: sow thinly, March-May, in a seed bed, 1.5cm (½") deep, directly into finely-prepared, well-cultivated, fertile soil, which has already been watered. Seedlings usually appear in 14-21 days. Water well until plants are established. Transplant 45cm (18") apart, when plants are about 10cm (4") tall. Allow 45cm (18") between rows. Plant firmly and water well. Or sow indoors, March-May, 0.5cm (¼") deep, in a tray of compost. Water well and place in a cold frame or unheated greenhouse. Keep moist. Transplant 5cm (2") apart to other trays, when large enough to handle. Gradually accustom young plants to outside conditions (avoid frosts) before planting out, May-July, into well-cultivated, fertile soil. Harvest: July-August sowings as 'greens' in February or March, or hearted from April -May. Harvest March-May sowings as 'greens' from September to November. Apply a high nitrogen fertiliser in early spring to give overwintered plants a welcome boost. Eat the outer, dark green leaves, as these have the most nutrients.